Ald. Matt O'Shea (19th) said he hopes the one in three women and one in four men who are the victim of domestic violence hear a "clear and simple message" from city officials — "We are here to help." CITY HALL — City employees who are the victims of domestic violence or sexual assault can take one month of paid leave under a new policy introduced Monday by Mayor Rahm Emanuel. Emanuel said the proposal — introduced during Domestic Violence Awareness month — is designed to assure victims that the city stands "shoulder to shoulder" with them and that they are not "alone or isolated." "No longer will they have to make the false choice between getting care or a paycheck," Emanuel said. "They can take their time — paid time — to get their lives together." The paid leave, which will need City Council approval, would be available to people who qualify under a state law known as the Victims’ Economic Security and Safety Act, Emanuel said. Ald. Matt O'Shea (19th) said he hopes the one-in-three women, and one-in-four men, who are victims of domestic violence hear a "clear and simple message" from city officials: "We are here to help." Domestic violence is the leading cause of injury to women between the ages of 15 and 44 in the United States, more than car accidents, muggings and sexual assault combined, officials said. The policy will train city department managers to recognize the signs of domestic violence and educate them about the resources available for all city employees, O'Shea said. In addition, employees who are victims of domestic violence or sexual assault are eligible for "reasonable work accommodations" — including a waiver from the city's requirement that employees live in the city, O'Shea said. O'Shea, whose Far Southwest Side ward is home to many city workers, said the new policy is "merely a first step." "We are asking large employers to step up," O'Shea said, and put a similar policy in place. For some victims of domestic violence, their time at work can be the only time they have away from their abusers, the alderman said. "The city has to be a good employer and a good corporate citizen," Emanuel said. Only three city employees have used the state law — signed in 2015 — to take unpaid leave, said Human Resources Commissioner Soo Choi. Emanuel said the new policy was designed to lessen the shame around domestic violence and sexual assault and allow victims to "come out of the shadows." "We want people to feel secure and eliminate any sense of isolation," Emanuel said. 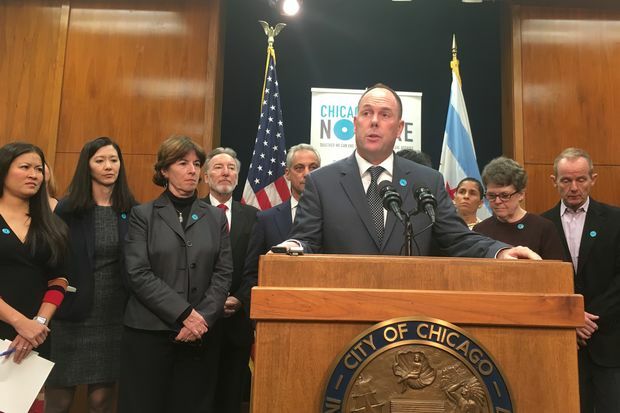 The proposed policy was developed by city officials in coordination with Chicago Says No More, a coalition of 20 businesses and 25 not-for-profit organizations with a mission to serve those affected by domestic violence and sexual assault. Employees who are victims of domestic violence can call the city's hotline at 877-863-6338. The Council next meets in December.